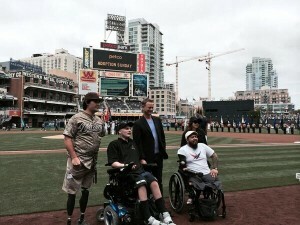 The San Diego Padres honored actor Gary Sinise during pre-game ceremonies Sunday for his efforts on behalf of veterans. Sunday’s game against the Detroit Tigers is “Military Opening Day” for the Padres, who traditionally host Navy and Marine personnel at Petco Park on Sundays. The players wear camouflage uniforms during Sunday home games. Photo credit: San Diego Padres via Twitter. Sinise’s foundation announced it will build homes in the San Diego area for wounded veterans Nick Kimmel and Jason Ross, who will accompany the actor to the game. The homes, built through a partnership between the Gary Sinise Foundation and Operation All the Way Home, are customized to ease the veterans’ daily challenges with features like retractable cook tops, cabinets and shelving, elevators and more — accessible via an iPad. Marine combat engineer Rob Jones, a double-amputee, was scheduled to throw the ceremonial first pitch. Jones, who lost his legs above the knees in an explosion in Afghanistan, used prostheses to ride a bicycle across the country to raise funds for wounded warriors. Jones was set to enter the field on his bicycle and ride around the warning track before throwing the first pitch, a team official said. Other pre-game ceremonies included an on-field recognition of more than 200 service members representing all branches of the armed services, who lined the base paths. A 50-state flag team from Marine Corps Recruit Depot also took to the field. Navy Band Southwest was scheduled to perform the national anthem and Marine Staff Sgt. Brent Williams was scheduled to sing “God Bless America” during the seventh inning stretch.